It’s Mixology Monday again. This month, Doug Winship at the Pegu Blog has declared the theme to be “Made from Scratch.” We are to make at least one of our own ingredients and decide if it’s worth the effort. I have written about Swedish Punsch before. This mix of Batavia arrack, neutral spirits, sugar, water, and various flavorings is common in its namesake country, but has largely become a lost ingredient to the US. 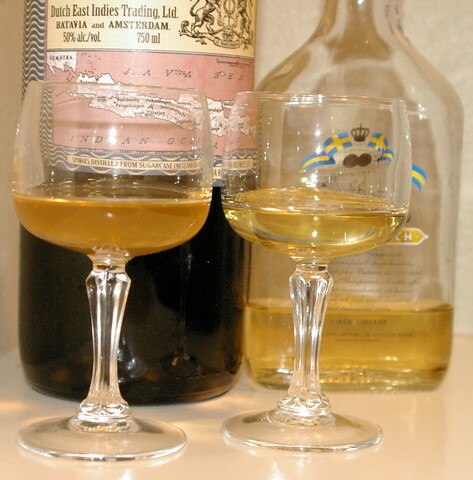 Haus Alpenz has helped minimize that loss by importing Batavia Arrack van Oosten, the one essential ingredient to making Swedish Punsch that is not readily available. I picked up a bottle when it became available in Washington State. I took one taste and was astonished at the aftertaste. I presume the source is the red rice that’s fermented as the start of the arrack making process. On its own, I found the Batavia arrack simply undrinkable. Luckily, Erik Ellestad at the Underhill-Lounge has already done the initial research on Swedish Punsch recipes, which is what I really wanted to make with the arrack. I decided to try his Tales of the Cocktail version. It sounded like a more traditional recipe and a great place to start. As I can’t get El Dorado in Washington, after consultation with Erik, I went with Appleton V/X. 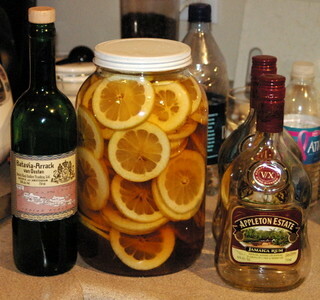 put the lemon slices, rum, and Batavia arrack in a gallon jar, seal and let steep for 6 hours. Make a tea with the water, tea, and cardamom pods, let steep for six minutes, then strain. Add sugar, let cool, and refrigerate if you’re making it ahead of time. Strain rum and arrack off lemons (do not juice the lemons). Mix with tea. Bottle and let sit at least overnight. Pour into resealable bottles (start with all those rum and arrack bottles you emptied). Total will be slightly over 3 liters (I filled four and a quarter 750 ml bottles). On first taste after mixing the lemon steeped rum and tea, I was a little worried, but the day I let it steep made a difference. I’m really happy with this recipe. I tasted mine alongside the Carlshamns. While the Carlshamns leads with sweetness, the Tales version starts with the lemon citrus flavor. The arrack is far more noticeable in the Tales version, but it’s much tamed down and the aftertaste I noticed drinking it straight is gone. Overall, I find the homemade Tales version to be far more flavorful and complex, and far less sweet than the commercially produced Carlshamns. I need to make all the cocktails I’ve tried with the Carlshamns, but naturally wanted to try something new. Searching for recipes, I stumbled on the Suédois in the CocktailDB. The only hint as to the source is that this is invented by G. Buller. If anybody knows who that is, I’d be delighted to know. The cocktail’s name is French for Swedish. Made as listed, I found that the gin brought out the harsher flavors in the Punsch. I added some vanilla simple syrup, and this smoothed out the drink and brought it all together. stir over ice for at least 30 seconds, strain into cocktail glass, sip and think of Sweden. bring ingredients to simmer, simmer covered for 2 minutes, remove from heat and steep for 2 hours. Strain into bottle. A big thanks to Doug for hosting this MxMo, which finally inspired me to make Swedish Punsch. I’ll be enjoying it for quite a while, given the amount I made, but happily, the recipe was a big success and I’m looking forward to more experiments with my ingredients, Made from Scratch! Now head on over to the Pegu Blog to see the whole wrap up from everybody who participated! What did the arak finish taste like? Is Swedish Punsch often drank by itself? The arrack finish was what I imagine the PTC strips taste like to a super-taster. Just this horrific bitter yuck taste that keeps on going. I believe the Swedes like to drink punsch with pea soup. I don’t think I could drink much of the Carlshamns straight, it’s a tad too sweet, but I expect I’ll occasionally have a shot of mine, perhaps with a rock or two. Maybe I’ll have to try it with some bittered ice! Ahhh, another Swedish Punsch maker! Great job Stevi! I am going to try out this out for sure. Any idea on the shelf-life of the punsch? The result is a liqueur, so it should be shelf stable for a long time. Me, I gave most of what I made away as gifts. I may soon need to make some more. Thats what I thought. The only thing that made me skeptical was a recipe for SP that I saw in this month’s Imbibe. Although quite different than the Underhill-Lounge variation, it was stated that the Punsch would last only two weeks. Two hours left of steeping. I will let you know the results.